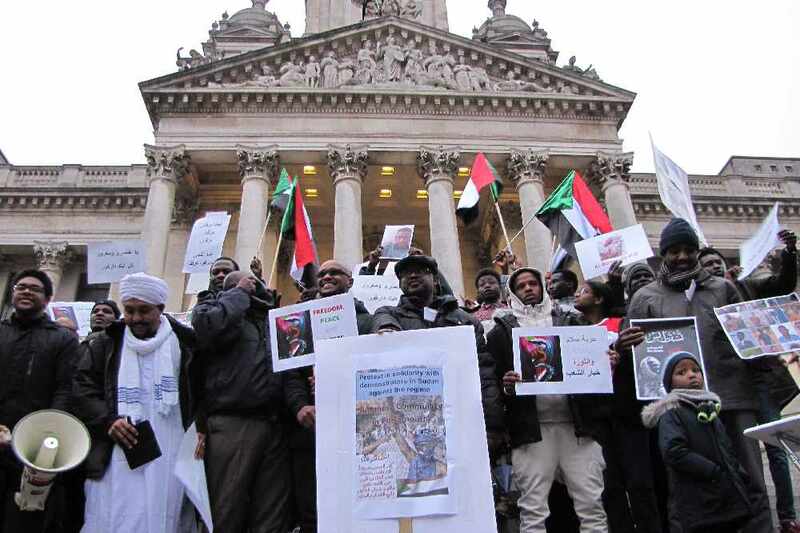 Over a hundred people gathered in the Guildhall Square Portsmouth on Saturday 19 January to show solidarity with protests in Sudan to overthrow the brutal dictator Omar al-Bashir. Protests across Sudan began in December 2018 over increases in bread prices and have developed into a pro-democracy movement. One of the organisers of the protest, Ihsan Eltom (pictured with her son Hadi) said "The European Union must stop funding the al-Bashir regime and condemn his brutal repression of the Sudanese people. He is wanted by the International Criminal Court for genocide and crimes against humanity. We call on the UK government to denounce the regime in Sudan". Another organiser Maher Deyab said "Members of the Portsmouth Sudanese community went to Trafalgar Square today to join protests there. We will keep on protesting till we get justice, peace and freedom for the people of Sudan".